If Ohio law has any meaning, the Ohio Election Commission (OEC) should immediately remove the current TV attack ad that slimes Democrat Roland Winburn — representative for District 43 in the Ohio House. It claims that Winburn, “Ripped us off.” This ad is nonsense — laughable in its extreme efforts to confuse and misinform listeners — it degrades the whole political process and provokes new levels of cynicism. Winburn’s opponent is Republican attorney Jeff Rezabek. His website says, “Jeff shares our principles.” Does Rezabek approve of this trash produced by the OHROC that slimes Winburn and completely misrepresents the facts? You’d think Rezabek would be embarrassed by the blatant dishonesty used by the ad. Winburn should build on Rezabek’s claim of “principles” and should call on Rezabek to disavow this ad. Any adolescent running for a middle school office would be disqualified if they dared to campaign using such a low stunt as used in this TV ad. Does the public have no protection in how our public airways are used? Ohio law says that it is illegal to broadcast campaign messages that are untrue. Where is the OEC? The ad says that Winburn, “failed to pay his own taxes on time while voting to raise our taxes by 800 million dollars.” It is laughable that in the OHROC’s effort to slime Winburn that this is the best they can do. The website referenced in the ad, rippoffroland.com, quotes from two Dayton Daily News articles. The ad makes four accusations all together — all purporting to prove that Winburn, “ripped us off.” In addition to the two above, it accuses Winburn of taking “an illegal tax credit,” and that he cut funding to local schools. The “illegal tax credit” charge is a rehash of an accusation made in the 2012 campaign that was thoroughly discredited. Winburn has been completely exonerated of any wrong doing. And Winburn has always supported funds for schools. It is shocking that an organization that represents Republicans already elected to the Ohio House — The Ohio House Republican Organizational Committee (OHROC) — would admit to creating and promulgating this trash TV ad. You’d think official Republicans would want to distance themselves from an ad this shameless. It will say a lot about the character of Winburn’s opponent if he refuses to disavow such immoral advertisement. It is true that because of the Republican agenda, a lot of taxpayers are being “ripped off.” But not by Winburn. His record shows that Winburn has opposed crazy tax changes made by the House Republicans that balanced the state budget by cutting funds to local communities and changed Ohio’s tax structure so that those taxpayers least able to pay taxes are paying at a higher rate than those taxpayers most able to pay. Most homeowners over age 65 will not qualify for the “homestead exemption” for their homes. Drastic cuts in state funds to schools and local governments mean that to continue service, more and more taxes will need to be approved at the local level. Sales tax will increase on all items. Decreases in the state income tax, for average or below average income earners, will not be nearly enough to cover these increases in taxes at the local level. 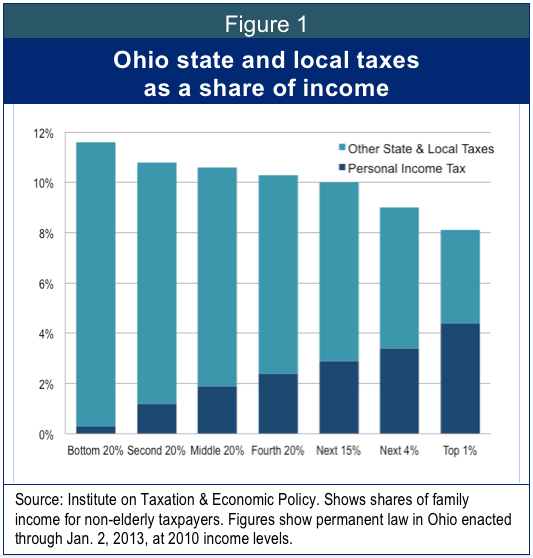 The total percentage of income paid in Ohio taxes will increase for most taxpayers.